Utilizing the Coanda effect, a basic principle of fluidics, Air Amplifiers become a simple, low cost way to circulate air, move smoke, fumes, and light materials. Using a small amount of compressed air as their power source, Super Air Amplifiers pull in large volumes of surrounding air to produce high volume, high velocity outlet flows through a fixed air gap. Quiet, efficient Air Amplifiers will create output flows up to 25 times their consumption rate. Both the vacuum and discharge ends of the Air Amplifier can be ducted, making them ideal for drawing fresh air from another location, or moving smoke and fumes away. Also effective to cool, clean and dry parts or processes. Utilizing the Coanda effect, a basic principle of fluidics, Air Amplifiers become a simple, low cost way to circulate air, move smoke, fumes, and light materials. Force and flow for the Adjustable Air Amplifier is changed by turning the exhaust end (with the knurled ring loose) to open or close the continuous air gap. When desired performance is obtained, the knurled ring can be tightened to lock the flow at that setting. Available in aluminum or in stainless steel for food service, higher temperatures (400°F/204°C), and corrosive applications. Custom materials, mounting options (flanges), and sizes available. Utilizing the Coanda effect, a basic principle of fluidics, Air Amplifiers become a simple, low cost way to circulate air, move smoke, fumes, and light materials. Using a small amount of compressed air as their power source, High Temperature Air Amplifiers pull in large volumes of surrounding air to produce high volume, high velocity outlet flows through a fixed air gap. Quiet, efficient Air Amplifiers will create output flows up to 25 times their consumption rate. High Temperature Air Amplifiers are rated to 700°F (374°C). EXAIR's VariBlast® Compact Safety Air Guns are a small and lightweight air gun capable of handling tough jobs. Designed with a variable flow trigger, they are able to produce different force values from the same nozzle simply by pulling the trigger. 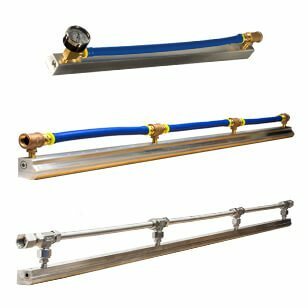 These air guns can be outfitted with all of EXAIR's 1/8 NPT engineered air nozzles and extensions are available up to 72" long. 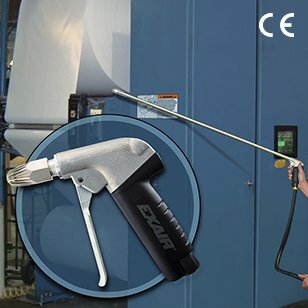 EXAIR's Soft Grip Safety Air Gun is ideal for hours of continuous use without fatigue. The ergonomic design keeps the hand in a comfortable position and incorporates a large trigger that permits operation with one or more fingers. The durable cast aluminum body is suited for rugged industrial use and includes a convenient hanger hook for easy storage. 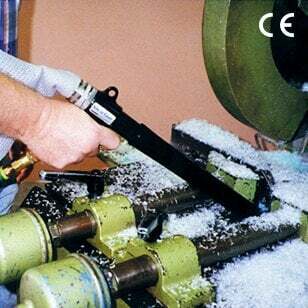 These guns minimize compressed air use, maintain OSHA pressure standard 1910.242(b) and reduce noise exposure by remaining under OSHA standard 29 CFR 1910.95(a) decibel limits. Extension pipes, chip shields and Stay Set Hoses available for most models. EXAIR's Heavy Duty Safety Air Gun is a powerful air gun that delivers high force for use in rugged, industrial environments. 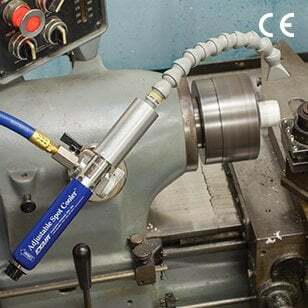 The 3/8 NPT compressed air inlet increases the compressed air flow available to the Super Air Nozzle, resulting in higher force and flow than other air guns. The durable cast curved trigger makes it comfortable for hours of use without fatigue. These guns minimize compressed air use, maintain OSHA pressure standard 1910.242(b) and reduce noise exposure by remaining under OSHA standard 29 CFR 1910.95(a) decibel limits. Aluminum Extension Pipes and Chip Shields are available. 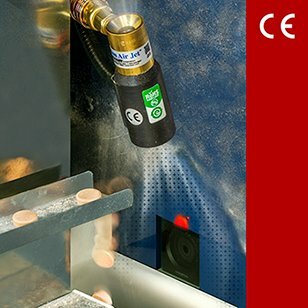 Super Blast Safety Air Guns provide the strongest blowing force - ideal for long distance, wide area blowoff, cooling and drying applications. The comfortable foam rubber handle provides a firm grip. The spring-loaded valve instantly shuts off the air supply if the air gun is dropped. Extension Pipes for hard to reach areas are also available. Chip Shields are durable polycarbonate shields that protects operators from flying debris often associated with blowing chips off machined parts. Chip Shields are also great for keeping coolant from spreading everywhere during drying operations. 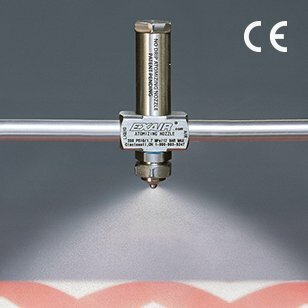 EXAIR’s Chip Shields help meet the requirements of OSHA 1910.242(b) for safe use of compressed air. 12' (3.7m) Coiled Hose with Swivels are available in 1/8, 1/4, and 3/8 NPT. Each includes 1/8 NPT adapters. 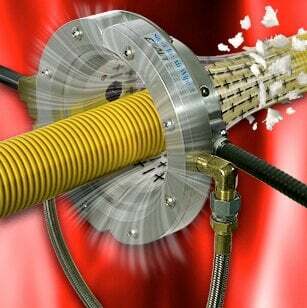 Use Model 900750 Coiled Hose with Soft Grip and VariBlast Safety Air Guns. Use Model 900751 Coiled Hose with Heavy Duty Safety Air Guns. EXAIR’s Super Air Knife is the most efficient compressed air knife on the market. It is engineered to dramatically reduce compressed air usage while entraining ambient air at a ratio of 40:1. Noise levels are greatly reduced when compared to other blowoffs. 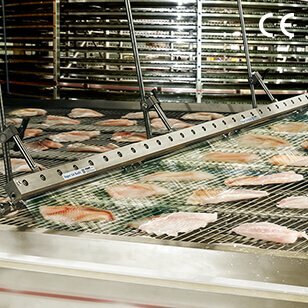 The Super Air Knife offers a more efficient way to clean, dry or cool parts, webs or conveyors. It delivers a uniform sheet of laminar airflow across the entire length with hard-hitting force. Available from stock 3” to 108” long and made from aluminum, 303SS, 316SS and PVDF to meet your application needs. Custom sizes and materials available. EXAIR’s original air knife design uses a Coanda profile which turns the airflow 90 degrees from its outlet. This creates a low pressure area capable of entraining ambient air at a ratio of 30:1 while producing a powerful airflow. Available from stock 3” to 48” long and made from aluminum or 303SS. Custom sizes and materials available. The Full-Flow Air Knife borrows engineering elements from our original standard air knife with the added benefit of an airflow across its entire length. They also provide the smallest footprint of our air knife line when mounting space is tight and cramped. These are a low cost choice and are available from stock 3” to 36” long and made from aluminum or 303SS. Custom sizes and materials available. The Model 9060 Universal Air Knife Mounting System is used to provide secure, precise positioning for any of the EXAIR Air Knives. It has a durable, stainless steel construction that is suitable for a variety of industrial applications. The Universal Air Knife Mounting System can be articulated into any position and provides a maximum extension of 30" (762mm). A 1/2" diameter through hole or a 1/2"-13 tapped hole is required for mounting. Super Air Knives that are 24" or longer must be supplied with compressed air at multiple inlets on the knife to ensure even airflow. Air Knife Plumbing Kits eliminate the need to search for the right fittings and ensure that your are using properly sized air supply lines. 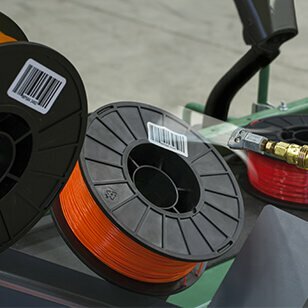 The kits include compressed air hose or pipe of the correct diameter and length plus fittings to interconnect the bottom or end compressed air inlets for best performance. With force values from 2 oz. (56.7g) through 22 oz. (624g) these nozzles are a simple solution to reduce excessive air consumption and noise levels on compressed air blowoff operations. 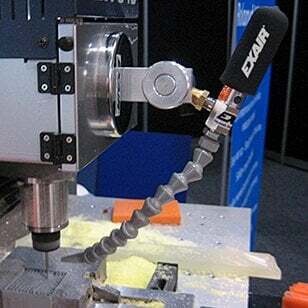 EXAIR engineered Air Nozzles and Jets produce outlet flows up to 25 times compressed air consumption using a small amount of compressed air as the power source. Many power companies now provide attractive rebates to plants who switch to engineered Super Air Nozzles! Air savings, compared to open copper tubes or pipes commonly used for blowoff, can be as high as 80%. Less compressed air means less noise. The typical noise level reduction is 10 dBA. 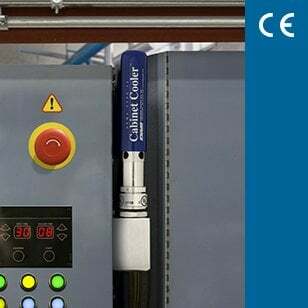 All EXAIR Air Nozzles and Jets meet Occupational Safety and Health Administration (OSHA) maximum dead end pressure and sound level exposure requirements and carry the CE mark. Some applications require extremely high force with extensive reach and these nozzles are the solution by offering force values from 1 lb (462 g) through 23 lbs (10.43 kg). EXAIR offers most standard nozzles in a high force version. With incredibly high blowing forces these nozzles are ideal for part ejection as well as blowoff, cooling and drying applications. EXAIR has engineered Large Super Air Nozzles that put the blowing capability of multiple nozzles into one single air nozzle. Hard-hitting force is measured in pounds, not ounces. All meet OSHA noise level and dead end pressure requirements. 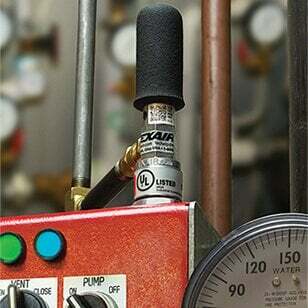 EXAIR’s Back Blow Air Nozzles are engineered to clean inside of pipe, tube, hose or channel. 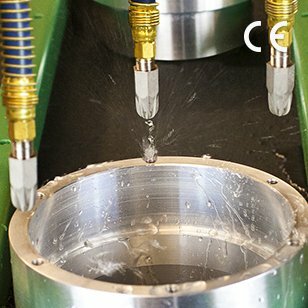 An array of holes provide a forceful 360° airflow to clear out coolant, chips or debris created from machining processes, axle and shaft failures or internal part defects. This nozzle prevents blowing chips further into a pipe or out the end of the pipe, which is a safety hazard. Since airflow is directed back toward the operator, personal protective equipment is recommended. Air Jets utilize the Coanda effect (wall attachment of a high velocity fluid) to produce air motion in their surroundings. A small amount of compressed air is throttled through an internal ring nozzle above sonic velocity. A vacuum is produced, pulling large volumes of surrounding, or “free” air, through the jet. Both the outlet and inlet can be ducted for remote positioning. If the end is blocked, flow simply reverses at well below OSHA dead end pressure requirements. Now you can put together the best combination that suits your blowoff, cooling, drying or cleaning application. Select the model number that includes your choice of Air Nozzle or Jet, a length of Stay Set Hose, and a one or two outlet magnetic base. You can also choose some of our most popular combinations already combined for your convenience. 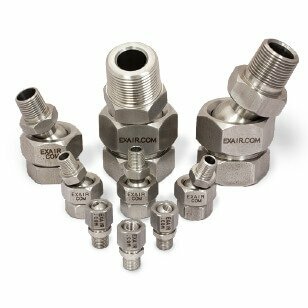 EXAIR's Swivel Fittings make it easy to adjust the aim of the Air Nozzles and Jets. Correct placement of the blowing angle can help optimize performance, reduce noise levels and improve efficiency. Swivel Fittings permit a movement of 25 degrees from the center axis for a total movement of 50 degrees. Type 303 or 316 Stainless Steel. For applications where frequent repositioning of the standard force Air Nozzles or Jet is required, the Flexible Stay Set Hoses™ are ideal. Simply mount the hose in close proximity to the application and bend it to aim the airstream at the target. Since the hose has “memory”, it will not creep or bend. It always keeps the aim until physically moved to the next position. 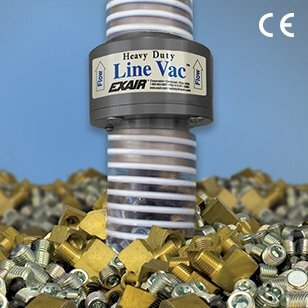 EXAIR's compressed air operated Line Vac connects to standard hose or tube to create a powerful in-line conveyor. The compact design features large throat diameters for maximum throughput capability. Line Vac conveyors are ideal for moving large volumes of material over long distances. 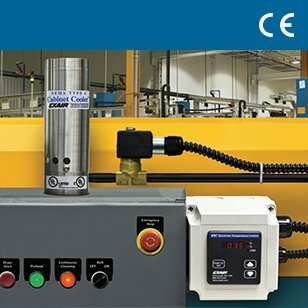 The material flow rate is easily controlled with a pressure regulator. No moving parts or electricity assures maintenance free operation. Sizes from 3/8" to 5" are available. Available in aluminum, Type 303 stainless steel or Type 316 stainless steel. EXAIR’s Threaded Line Vac air operated conveyors convert ordinary pipe into a powerful conveying system for parts, scrap, trim and other bulk materials. 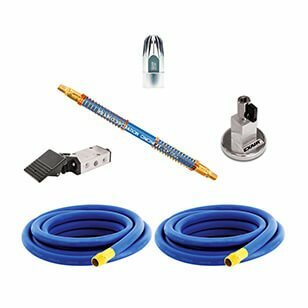 The Threaded Line Vac attaches easily to plumbing pipe couplers, making it easy to build a complete system using ordinary pipe and fittings available from any home center, hardware store or plumbers supply. Performance is the same as our standard Line Vac. Models from 3/8 to 3 NPT are available in aluminum and stainless steel, which are suited to a wide variety of applications. No moving parts or electricity assures maintenance free operation. The Heavy Duty Line Vac is EXAIR's most powerful conveyor. The appearance is similar to the standard Line Vac but performance has been boosted dramatically. The Heavy Duty Line Vac has been engineered to convey materials over longer vertical and horizontal distances and/or convey abrasive materials. The hardened alloy construction helps prevent premature wear that could occur with ordinary aluminum or stainless steel Line Vacs. 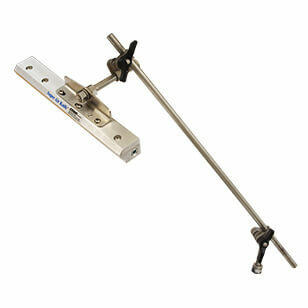 Also available in a threaded model from 3/4 to 3 NPT. 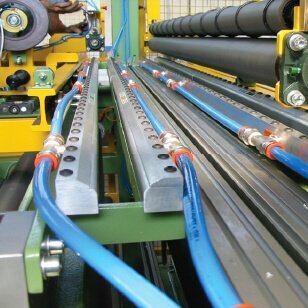 EXAIR’s Heavy Duty Threaded Line Vac is our most powerful conveyor which converts ordinary pipe into a powerful conveying system to move more material over longer distances. A hardened alloy construction resists wear from abrasive scrap, trim and other bulk materials. 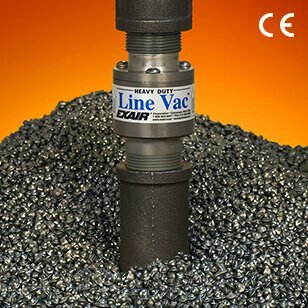 The Heavy Duty Threaded Line Vac attaches easily to plumbing pipe couplers, making it easy to build a complete system using ordinary pipe and fittings. 3/4 NPT through 3 NPT threads available. 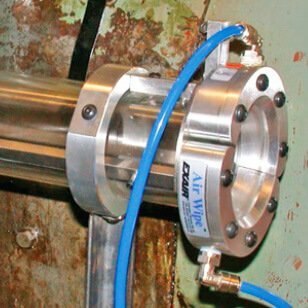 EXAIR's Sanitary Flange Line Vac is the best way to convey materials in systems which require frequent or mandatory cleaning. The Sanitary Flange Line Vac fits within your current sanitary flange piping system and converts it into a conveyor for waste, parts, and bulk materials. EXAIR’s Light Duty Line Vac is the ideal way to convey small volumes of materials over short distances. 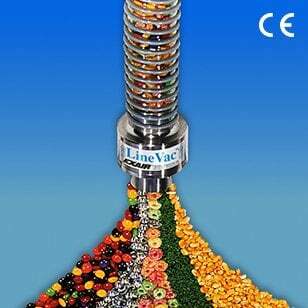 Like the Line Vac, the Light Duty Line Vac converts an ordinary hose or tube into a conveyor for scrap, trim and bulk materials. 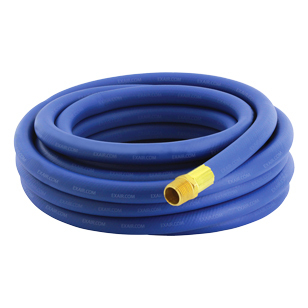 In stock for all hose compatible Line Vacs up to 3", this transparent conveying hose is a spiral reinforced PVC material used for a variety of material transfer applications. Available in 10', 20', 30', 40' and 50' lengths. Service temperature rating is -4°F (-20°C) to 150°F (+65°C). 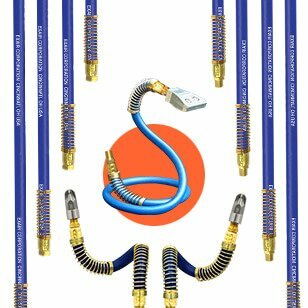 EXAIR’s Super Air Wipe provides a uniform 360° airstream that is ideal for blowoff, drying, cleaning and cooling of pipe, cable, extruded shapes, hose, wire and more. The split design offers easy clamping around the surface of the material moving through it, eliminating the need for threading. Available from stock in diameters from 1/2" to 11" and made from aluminum or type 303 stainless steel. Custom materials and sizes can be made to order. 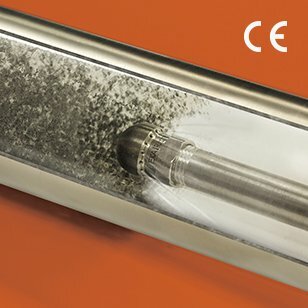 EXAIR’s Standard Air Wipe provides a uniform 360° airstream that is ideal for blowoff, drying, cleaning and cooling of pipe, cable, extruded shapes, hose and more. The split design offers easy clamping around the surface of the material moving through it, eliminating the need for threading. The Standard Air Wipe is a good choice when the added durability of stainless steel screws, shims and hose are not required. Custom sizes and materials available. 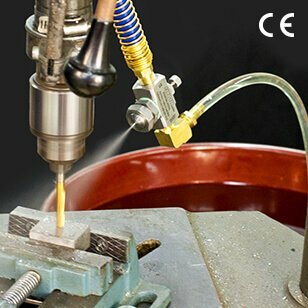 Internal mix nozzles mix the liquid and air inside the air cap and produce the finest atomization. Internal mix nozzles can be used on liquids with a viscosity up to 300 cP. Both air and liquid sides are pressure fed. Made from 303SS for corrosion resistance. External mix nozzles have the highest flow rates and allow the air and liquid flows to be adjusted independently. These nozzles are best where precise liquid flow is needed. External mix nozzles can be used on liquids with a viscosity above 300 cP. Both air and liquid sides are pressure fed. Made from 303SS for corrosion resistance. Siphon fed nozzles require no liquid pressure and can be used with gravity fed liquids or lift liquids from a siphon height as much as 36 inches (91cm). Siphon fed nozzles can be used on liquids with a viscosity up to 200 cP. Made from 303SS for corrosion resistance. 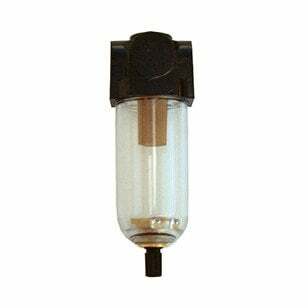 Internal mix nozzles mix the liquid and air inside the air cap and produce the finest atomization. Internal mix nozzles can be used on liquids with a viscosity up to 300 cP. Both air and liquid sides are pressure fed. No drip models also available to preserve precious liquids and protect product finished from drips. Made from 303SS for corrosion resistance. 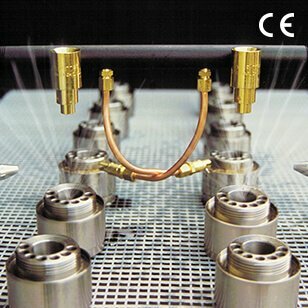 External mix nozzles have the highest flow rates and allow the air and liquid flows to be adjusted independently. These nozzles are best where precise liquid flow is needed. 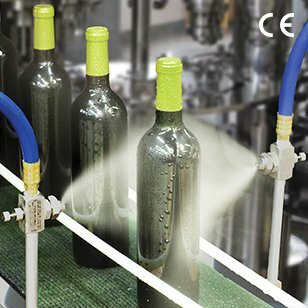 External mix nozzles can be used on liquids with a viscosity above 300 cP. Both air and liquid sides are pressure fed. No drip models also available to preserve precious liquids and protect product finished from drips. Made from 303SS for corrosion resistance. Siphon fed nozzles require no liquid pressure and can be used with gravity fed liquids or lift liquids from a siphon height as much as 36 inches (91cm). Siphon fed nozzles can be used on liquids with a viscosity up to 200 cP. No drip models also available to preserve precious liquids and protect product finished from drips. Made from 303SS for corrosion resistance. 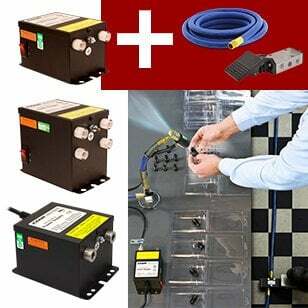 A low cost, reliable way to cool and purge electronic control panels. EXAIR Cabinet Coolers incorporate a vortex tube to produce cold air from compressed air - with no moving parts. The compact Cabinet Cooler can be installed in minutes through a standard electrical knockout. NEMA 12 (IP54) Cabinet Coolers are available in many cooling capacities for large and small control panels. All Cabinet Coolers are UL Listed and CE compliant. A NEMA 12 Cabinet Cooler® System is available with a thermostat control or in a continuous operation system. Each of these systems will include a water-dirt filter separator to prevent water condensate and dirt from entering your enclosure and cold air distribution kit used to direct the air for circulation or on to hot spots. A low cost, reliable way to cool and purge electronic control panels. EXAIR Cabinet Coolers incorporate a vortex tube to produce cold air from compressed air - with no moving parts. The compact Cabinet Cooler can be installed in minutes through a standard electrical knockout. NEMA 4 (IP66) Cabinet Coolers (dust-tight, oil-tight, splash resistant, indoor/outdoor service) incorporate a low pressure relief valve for both the vortex tube and cabinet air exhaust. This valve closes and seals when the cooler is not operating to maintain the integrity of a NEMA 4 enclosure. NEMA 4 (IP66) Cabinet Coolers are available in many cooling capacities for large and small control panels. All Cabinet Coolers are UL Listed and CE compliant. A NEMA 4 Cabinet Cooler® System is available with a thermostat control or in a continuous operation system. Each of these systems will include a water-dirt filter separator to prevent water condensate and dirt from entering your enclosure and cold air distribution kit used to direct the air for circulation or on to hot spots. A low cost, reliable way to cool and purge electronic control panels. EXAIR Cabinet Coolers incorporate a vortex tube to produce cold air from compressed air - with no moving parts. The compact Cabinet Cooler can be installed in minutes through a standard electrical knockout. NEMA 4X (IP66) Cabinet Coolers (dust-tight, oil-tight, splash resistant, indoor/outdoor service) incorporate a low pressure relief valve for both the vortex tube and cabinet air exhaust. 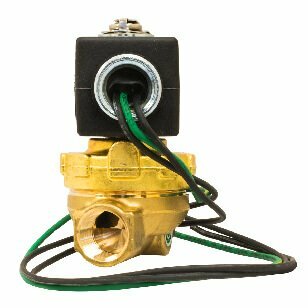 This valve closes and seals when the cooler is not operating to maintain the integrity of a NEMA 4X enclosure. NEMA 4X (IP66) Cabinet Coolers are constructed of stainless steel for food service and corrosive environments. They are available in many cooling capacities for large and small control panels. All Cabinet Coolers are UL Listed and CE compliant. A NEMA 4X Cabinet Cooler® System is available with a thermostat control or in a continuous operation system. Each of these systems will include a water-dirt filter separator to prevent water condensate and dirt from entering your enclosure and cold air distribution kit used to direct the air for circulation or on to hot spots. EXAIR’s Side Mount Kits make mounting on the side of an electrical enclosure possible when there is limited space on the top or side. (NEMA 4 and 4X Cabinet Cooler Systems must be mounted vertically.) The Side Mount Kits maintain the NEMA rating of large and small NEMA Type 12, 4 and 4X enclosures. They mount in a standard electrical knockout (1-1/2 NPS). Side Mount Kits for NEMA 12 Cabinet Cooler Systems have an aluminum construction. Those for NEMA 4 and 4X Cabinet Cooler Systems are Type 303 or Type 316 stainless steel. 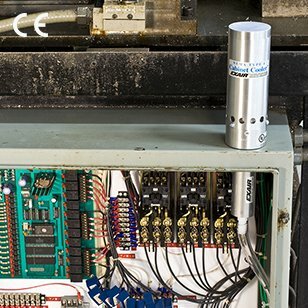 Kits including a solenoid valve and thermostat are available to retrofit existing Cabinet Coolers which are operating continuously. Using a thermostat and solenoid on your Cabinet Cooler is the most efficient, and recommended, way to operate a Cabinet Cooler. The thermostat and solenoid valve will turn the Cabinet Cooler on and off as needed to maintain a cool internal environment for your cabinet. Available for NEMA 12, 4 and 4X Cabinet Coolers. Hazardous Location NEMA 4 (IP66) Cabinet Coolers are engineered and approved for use upon purged electrical enclosures found within classified areas. The areas approved are Class I Div 1, Groups A, B, C and D; Class II Div 1 Groups E, F and G; and Class III. These HazLoc Cabinet Cooler Systems have been tested by UL and meet the stringent UL requirements for these areas. Cabinet Cooler systems are a low cost and reliable way to cool purged electric control panels founds in the environments. Hazardous Location NEMA 4 (IP66) Cabinet Coolers are available in cooling capacities from 1,000 Btu/Hr. to 5,600 Btu/Hr. They can be installed in minutes through a standard electrical knockout. Hazardous Location NEMA 4 Cabinet Cooler® Systems are available with a thermostat control or as a continuous operation system. NEMA 4 (IP66) Cabinet Coolers (dust-tight, oil-tight, splash resistant, indoor/outdoor service) incorporate a low pressure relief valve which closes and seals when the cooler is not operating to maintain the integrity of a NEMA 4 enclosure. Each of these systems include a water-dirt filter separator to prevent water condensate and dirt from entering your enclosure and a cold air distribution kit used to direct the air for circulation or on to hot spots. All Cabinet Coolers are UL Classified and CE compliant. 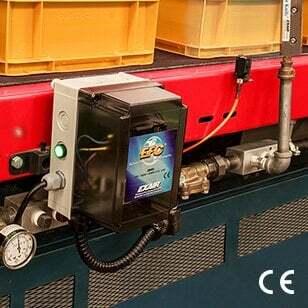 EXAIR's HazLoc Cabinet Cooler Systems are not purged and pressurized control systems and should not be relied upon nor used in place of a purged and pressurized controller. They are meant for use in conjunction with a purged and pressurized control system. Hazardous Location NEMA 4X (IP66) Cabinet Coolers are engineered and approved for use upon purged electrical enclosures found within classified areas. The areas approved are Class I Div 1, Groups A, B, C and D; Class II Div 1 Groups E, F and G; and Class III. These HazLoc Cabinet Cooler Systems have been tested by UL and meet the stringent UL requirements for these areas. Cabinet Cooler systems are a low cost and reliable way to cool purged electric control panels founds in the environments. Hazardous Location NEMA 4X (IP66) Cabinet Coolers are constructed of stainless steel for food service and corrosive environments and are available in cooling capacities from 1,000 Btu/Hr. to 5,600 Btu/Hr. They can be installed in minutes through a standard electrical knockout. Hazardous Location NEMA 4X Cabinet Cooler® Systems are available with a thermostat control or as a continuous operation system. NEMA 4X (IP66) Cabinet Coolers (dust-tight, oil-tight, splash resistant, indoor/outdoor service) incorporate a low pressure relief valve which closes and seals when the cooler is not operating to maintain the integrity of a NEMA 4X enclosure. Each of these systems include a water-dirt filter separator to prevent water condensate and dirt from entering your enclosure and a cold air distribution kit used to direct the air for circulation or on to hot spots. All Cabinet Coolers are UL Classified and CE compliant. 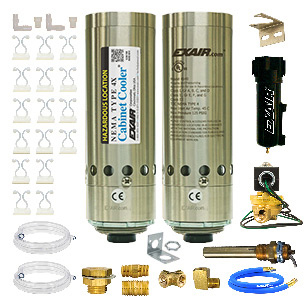 EXAIR's HazLoc Cabinet Cooler Systems are not purged and pressurized control systems and should not be relied upon nor used in place of a purged and pressurized controller. 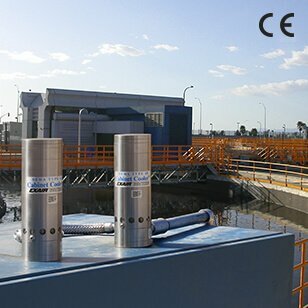 They are meant for use in conjunction with a purged and pressurized control system. A new solution to an old problem. Heat build up on dry machining operations reduces tool life and machining rates. The Cold Gun Aircoolant System™ produces a stream of clean, cold air at 50°F (28°C) below supply air temperature. Operation is quiet and there are no moving parts to wear out. It will remove heat to prolong tool life and increase productivity on machining operations when liquid coolants cannot be used. 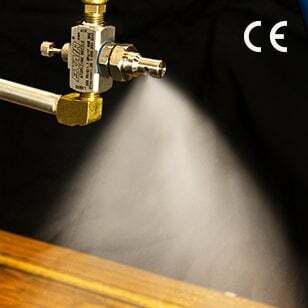 The Cold Gun is also an alternative to expensive mist systems. It eliminates the costs associated with the purchase and disposal of cutting fluids and worker related health problems from breathing airborne coolants or slipping on wet floors. EXAIR's compressed air operated Reversible Drum Vac System attaches quickly to any closed head 30, 55 or 110 gallon drum. 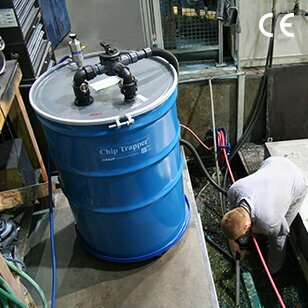 Its compressed air powered vacuum fills a 55 gallon drum in less than two minutes. With the simple turn of a knob, the same stainless steel pump quickly empties the drum. Floor level coolant sumps can be easily refilled, floor spills vacuumed, or contaminated liquids transferred to filtration tanks in minutes. The flow rate in and out of the drum can be controlled with the knob, making it ideal for dispensing liquids. EXAIR’s Mini Reversible Drum Vac System delivers the same two-way action for small jobs. It comes complete with a 5 gallon drum and all the tools. EXAIR's compressed air operated High Lift Reversible Drum Vac System attaches quickly to any closed head 30, 55 or 110 gallon drum. 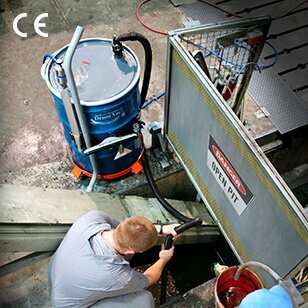 Its high powered vacuum is able to lift liquids up to 15 feet and fill a 55 gallon drum in less than 85 seconds. With the simple turn of a knob, the same stainless steel pump quickly empties the drum. The High Lift Reversible Drum Vac has the extra power you need to move liquids from below grade work areas, sumps or tanks up to 15 feet! The patented Chip Trapper offers a fast, easy way to clean chips, swarf and shavings out of used coolants and other liquids. 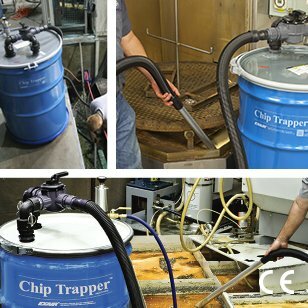 The Chip Trapper vacuums the coolant or liquid that is filled with debris and traps all the solids in a reusable filter bag. Only the liquid pumps back out. It is ideal for use on machines with sumps, parts washers, tanks and storage containers of contaminated liquids. EXAIR's compressed air operated High Lift Chip Trapper System attaches quickly to the closed head 30, 55 or 110 gallon drum. Its high powered vacuum is able to lift liquids up to 15 feet vertical and fill a 55 gallon drum in less than 85 seconds. With the simple turn of a knob, the same stainless steel pump quickly empties the drum. The High Lift Chip Trapper has the extra power you need to move liquids from below grade work areas, sumps or tanks. Complete with a 20' hose it can also reach farther. 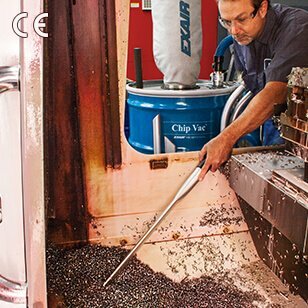 EXAIR's Chip Vac picks up dry or wet chips and delivers them directly to an ordinary open-top drum. The Chip Vac is used to clean chips from fixtures, floors and work surfaces of machining centers, lathes, saws, mills and other industrial equipment. The powerful suction is ideal for fast and efficient cleaning. 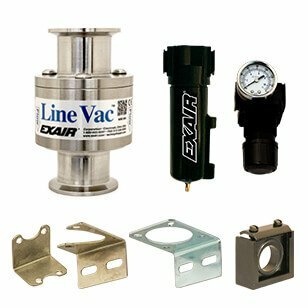 EXAIR’s Mini Chip Vac System delivers the same cleaning power for small jobs. It comes complete with a 5 gallon drum and all the tools. 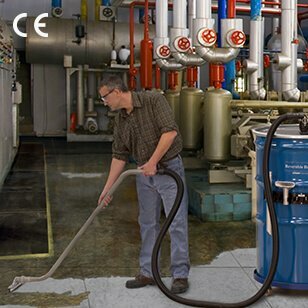 EXAIR's Heavy Duty Dry Vac attaches to an ordinary 30, 55 or 110 gallon open-top drum to turn it into a powerful, industrial duty vacuum cleaner. The Heavy Duty Dry Vac has been engineered to vacuum more dry materials in less time with less wear. Designed for tough industrial environments, the hardened alloy construction resists premature wear while the increased power handles difficult jobs and harsh conditions. 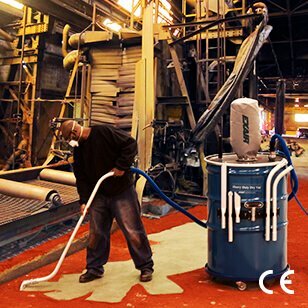 Engineered for dusty environments that require regular cleaning, the Heavy Duty HEPA Vac is designed with high capacity in mind. 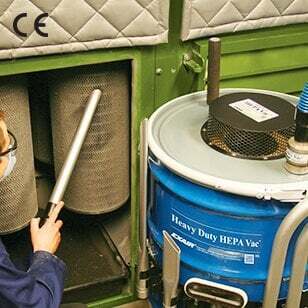 The HEPA Vac attaches to an ordinary 55 or 110 gallon open top drum to turn it into a powerful, HEPA (High Efficiency Particulate Air) quality, industrial vacuum cleaner. Like the Heavy Duty Dry Vac, it’s powerfully designed to move more material with less wear. In addition, the Heavy Duty HEPA Vac has been engineered to filter contaminants to HEPA requirements in dusty environments requiring frequent cleaning. 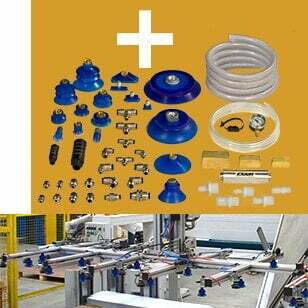 A low cost solution to a wide variety of industrial housekeeping problems. The Vac-u-Gun is a vacuum gun, a blow gun and a transfer tool all in one. Lightweight and easy to use, the Vac-u-Gun has durable die cast construction with no moving parts to wear out. A low cost solution to quickly remove chips and contaminants from grooves, containers and drilled holes. Extracting chips/contaminants from grooves, containers and drilled holes and transfer them into a common container or into a filter bag. Eliminate the risk of hazardous flying objects. 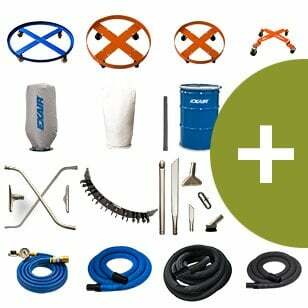 This includes the replacement parts and tools for any of the Industrial Housekeeping products. 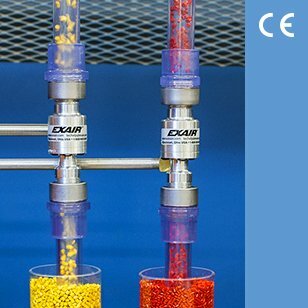 EXAIR’s EFC™ is a user-friendly electronic flow control for compressed air that is designed to minimize compressed air use on blow off, drying, cooling, conveying and static elimination operations. The EFC combines a photoelectric sensor with a timing control that limits compressed air use by turning it off when no part is present. The timing control permits easy tuning to the application requirements while providing flexibility in sensing distance. Available to improve applications with flow up to 350 SCFM. 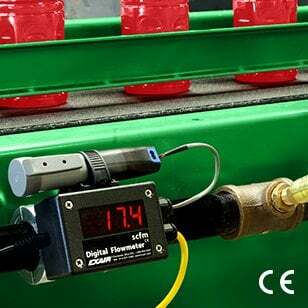 EXAIR’s Digital Flowmeter, with data logging capability available, is the easy way to monitor compressed air consumption and waste! The digital display shows the exact amount of compressed air being used, making it easy to identify costly leaks or inefficient air products. No cutting, welding, adjustments or calibration are ever required. 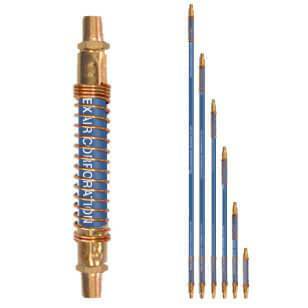 It is designed for permanent or temporary mounting to a compressed air pipe. If the unit needs to be removed, blocking rings are available. Available for measuring air flow in SCFM or m³/hr. on schedule 40 iron pipe from 1/2"-4" diameter. Flow meters for copper pipe also available. Plants that aren’t maintained can easily waste up to 30% of the compressor output through leaks that go undetected. 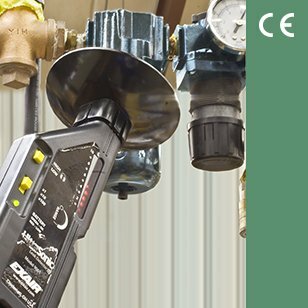 The Ultrasonic Leak Detector (ULD) is a hand-held, high quality instrument that can locate costly leaks in a compressed air system. A person using the ULD need only aim it in the direction of a suspected leak. When a leak is present, an audible tone can be heard with the use of the headphones, and the LED display will light. Hearing loss induced by high noise in the workplace is a common problem. Exposure to high noise levels for an extended period of time can lead to permanent hearing loss for workers not wearing proper hearing protection. 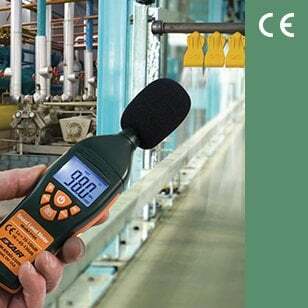 The Digital Sound Level Meter can help employers protect workers by monitoring noise levels so they don't exceed the limits shown in OSHA Standard 29 CFR – 1910.95(a). 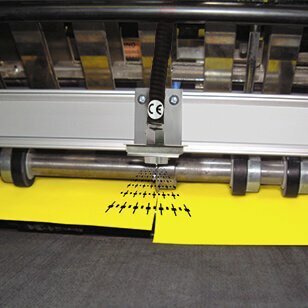 EXAIR's Gen4 Super Ion Air Knife removes static electricity from plastics, webs, sheet stock and other product surfaces where tearing, jamming or hazardous shocks are a problem. 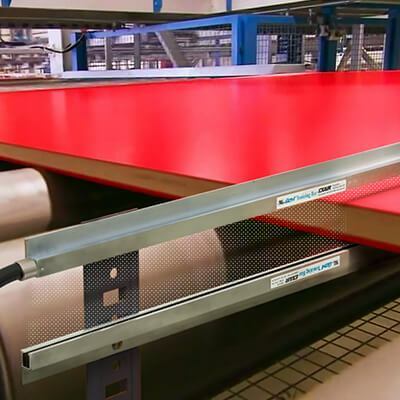 The laminar sheet of air sweeps surfaces clean of static, particulate, dust and dirt. 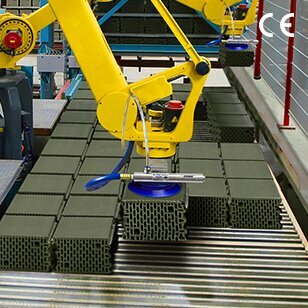 Production speeds, product quality and surface cleanliness can improve dramatically. The Gen4 Super Ion Air Knife provides the best performance of all ionizers. It uses our Super Air Knife (40:1 air amplification) to deliver a uniform sheet of ionized air effective up to 20 feet (6.1m) away. The Gen4 Standard Ion Air Knife uses our Standard Air Knife (30:1 air amplification) to deliver a sheet of ionized air to the surface. Air consumption and noise are somewhat higher than the Gen4 Super Ion Air Knife. In some situations, even the smallest amount of airflow can disturb the product. This is especially true for lightweight materials. 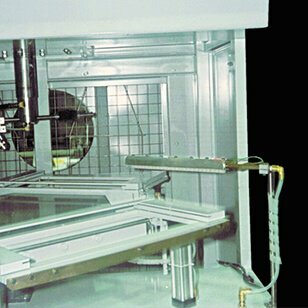 Gen4 Ionizing Bars are ideal for relatively flat materials, where the bar can be mounted close to the product surface. 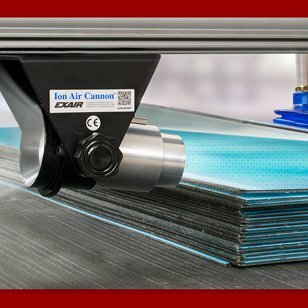 EXAIR's Gen4 Super Ion Air Wipe provides a uniform 360° ionized airstream that is easy to clamp around a part for eliminating static electricity and contaminants. It is ideal for use on pipe, cable, extruded shapes, hose, wire and more. It maximizes ionized airflow while minimizing compressed air consumption. EXAIR's Gen4 Ion Air Cannon neutralizes static electricity and cleans at distances up to 15 feet (4.6m) with no moving parts. It is ideal for those hard to reach spaces, confined areas that require a concentrated flow of static eliminating ions or on a benchtop. With an optional pressure regulator, the air volume and velocity are infinitely adjustable over a wide range, for light to heavy duty applications. 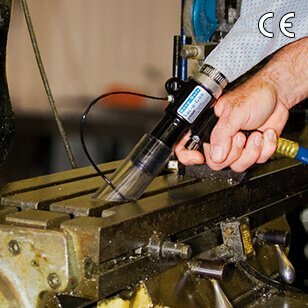 EXAIR's Gen4 Ion Air Gun combines incredibly fast static decay rates with low compressed air consumption. It is the ideal way to remove static, contaminants and dust from three dimensional parts prior to assembly, packaging, painting or finishing. 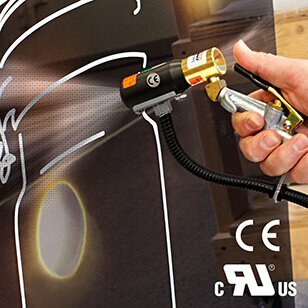 The Gen4 Ion Air Gun neutralizes static electricity and cleans at distances up to 15 feet (4.6m). 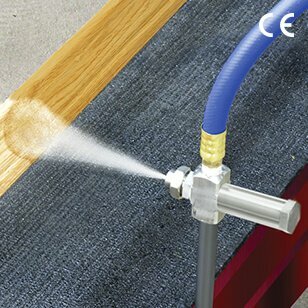 EXAIR's Gen4 Ion Air Jet delivers a concentrated airflow that can cover a precise spot without disturbing other areas. This quiet, focused airstream provides incredibly fast static decay rates and cleaning ability. 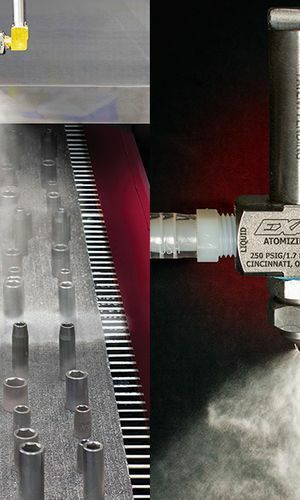 The Gen4 Ion Air Jet is the ideal way to remove static and dust from small parts prior to shrink wrapping, packaging, printing, painting or finishing. The Gen4 Stay Set Ion Air Jet comes complete with a magnetic base that allows easy mounting and portability on a machine, a bench or other surface. A shutoff valve on the base provides infinite control of the force and flow. For hands free operation, an optional Model 9040 Foot Pedal (requires floor or machine mounting) is available. In some situations, even the smallest amount of airflow can disturb the product. This is especially true for lightweight materials. 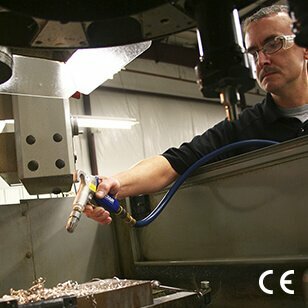 EXAIR manufactures two styles of ionizers for these critical applications. 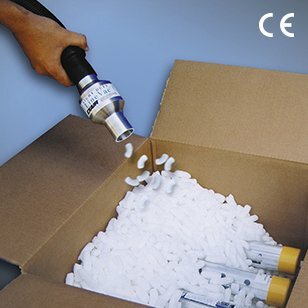 The Gen4 Ionizing Point is effective for spot neutralization. The compact size makes it ideal for winding or slitting operations. It can also be mounted through a duct to neutralize static charges due to moving air or materials. Selectable Voltage Power Supplies - Allow you to select either 115V or 230V input on one Power Supply. Integrated fuse protects against voltage spikes, modular cable eases routing, electromagnetic shielding protects other sensitive electronics. Choose 2 outlet or 4 outlet model. For use with Gen4 Super Ion Air Knife, Gen4 Standard Ion Air Knife, Gen4 Ionizing Bars, Gen4 Ion Air Cannon, Gen4 Ion Air Gun, Gen4 Super Ion Air Wipe, Gen4 Ion Air Jet and Gen4 Ionizing Point only. Single Voltage Power Supplies - The Two and Four Outlet Power Supplies require an input of 115 VAC, 50/60 Hz. Two other variations for 230 VAC are also available. A 6' (1.83m) power cord and lighted power switch are included. Power Supplies are UL Listed to U.S. and Canadian safety standards, and are CE and RoHS compliant. For use with old style Super Ion Air Knife, Standard Ion Air Knife and Ionizing Bars. 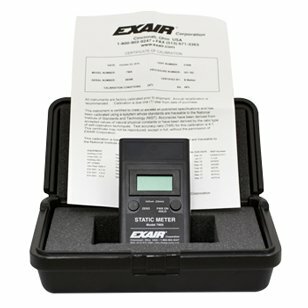 The Model 7905 Digital Static Meter allows easy one-hand static measurements. In most cases, the highest voltage reading will indicate the source of the static problem. Sensitive and responsive, it indicates the surface voltage and polarity on objects up to ±20 kV when measured one inch (25mm) away. The Model 7929 AC Sensor provides non-contact verification that a voltage is present. The tip glows bright red and an audible tone is heard when voltage is detected. These single stage, cylindrical units are compact and easy to mount at the point of use. They can be held in place by threading them directly onto a compressed air line or with the use of a mounting clip. There are 7 models available for use with porous materials like cardboard, with vacuum levels up to 21" Hg (71 kPa) and vacuum flows up to 18.5 SCFM (524 SLPM). There are 7 models available for use with non-porous materials such as glass, with vacuum levels up to 27" Hg (91 kPa) with vacuum flows up to 15.8 SCFM (447 SLPM). EXAIR’s Adjustable E-Vacs are a series of low cost, compressed air powered vacuum generators where the vacuum and flow rates can be easily adjusted to suit the application requirements. These vacuum pumps are ideal for a wide variety of pick and place, box opening, clamping, lifting, chucking and surface mounting applications. They are maintenance free and have no moving parts to wear out. EXAIR offers a variety of mufflers, tubing, check valves, and fittings that make it easy to build a vacuum system best suited to your vacuum application. 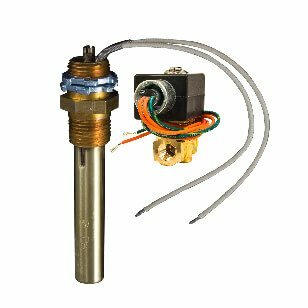 Temperatures, flows and cooling power are adjustable over a wide range using the control valve on the hot end exhaust. A low cost, reliable, maintenance free solution to a variety of industrial spot cooling problems. With the turn of a knob, you can select the temperature best suited to your application. The Adjustable Spot Cooler provides a precise temperature setting from -30°F (-34°C) to room temperature. A swivel magnetic base provides easy mounting and portability. Flexible tubing that holds its position directs the cold air. No moving parts or CFC’s assures maintenance free operation. A proven way to reduce downtime and increase productivity on a variety of operations involving small parts where heat is a problem. 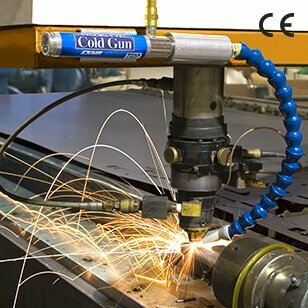 EXAIR’s Mini Cooler produces a stream of 20°F (-7°C) cold air to prevent heat build-up. 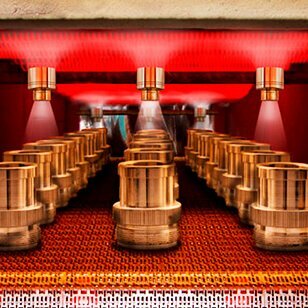 The Mini Cooler is particularly effective on high speed operations to prevent burning, melting and heat related breakage. Operation is quiet (76 dBA) and there are no moving parts to wear out. 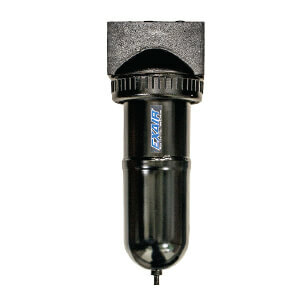 EXAIR's Filter Separators remove water, dirt and rust from your compressed air system. 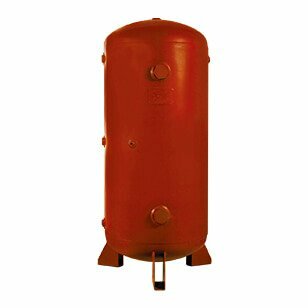 They prevent these contaminants from plugging or damaging the compressed air products. A Filter Separator should be installed prior to an oil removal filter, pressure regulator or valve. All but one model feature an automatic drain which empties accumulated liquid and debris from the bowl with a float mechanism. EXAIR's Model 9027, 9005, 9006, and 9010 Oil Removal Filters remove oil and solid particulate that is typical of many compressed air systems. A 0.03 micron element is used to trap submicron particles. An internal float automatically activates the drain when full. 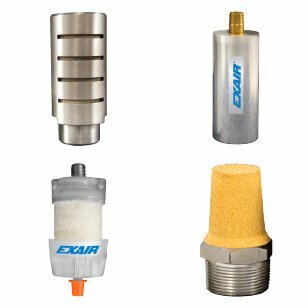 EXAIR's Pressure Regulators permit easy selection of an operating pressure that will allow the air product to work properly without using excessive amounts of compressed air. Reducing the air pressure from 100 PSIG to 80 PSIG reduces energy use by almost 20%. 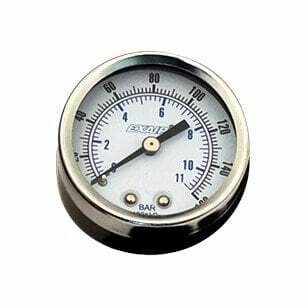 Many sizes are available and a pressure gauge is included. 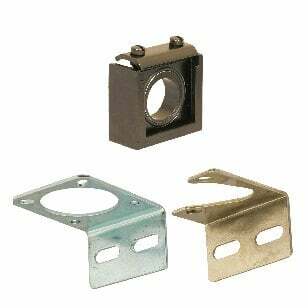 Mounting brackets are used to mount Filters and Pressure Regulators to a frame, wall or sturdy surface. Coupling brackets are used to couple the filter and regulator together to create a rigid, sealed assembly. For applications where frequent repositioning of the air product is required, the Flexible Stay Set Hoses™ are ideal. Simply mount the hose in close proximity to the application and bend it. Since the hose has “memory”, it will not creep or bend. It will always keep the aim until physically moved to the next position and will withstand temperatures of up to 158°F (70°C). 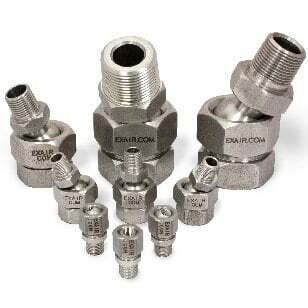 EXAIR's Swivel Fittings make it easy to adjust the position of the Air Nozzles, Air Jets and Air Amplifiers. Swivel Fittings permit a movement of 25 degrees from the center axis for a total movement of 50 degrees. Type 303 and 316 Stainless Steel. Magnetic bases are suited to applications where frequent movement of the air product is required. The powerful magnet permits horizontal or vertical mounting. A valve is provided that can be used to vary the force and flow. 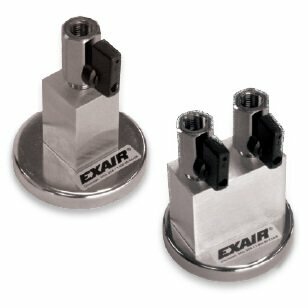 EXAIR's normally closed Solenoid Valves are available in a variety of flow rates and voltages. All models are UL Listed and are CE and RoHS compliant. 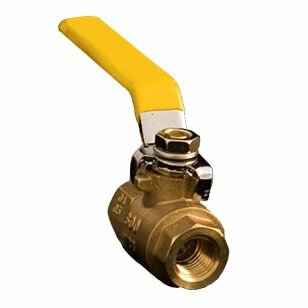 Manual quarter turn ball valves are available from 1/4 NPT through 1-1/4 NPT. 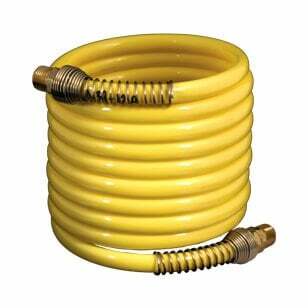 Compressed air hose, available in 3/8" or 1/2" inside diameter, is made of reinforced synthetic rubber to assure long life and protection against ozone, weathering, and temperatures up to 158°F (70°C). Includes a 1/4 NPT or 1/2 NPT male brass fitting on each end. Hose lengths are 10', 20', 30', 40' and 50'. In stock for all hose compatible Line Vacs up to 3". 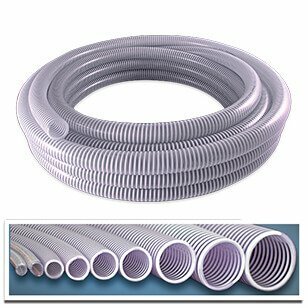 This transparent conveying hose is a spiral reinforced PVC material used for a variety of material transfer applications. 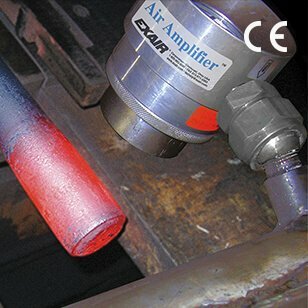 EXAIR Silencing Mufflers help to reduce work area noise produced by air exhausting from cylinders, valves and other air powered equipment. Per OSHA Standard 1910.95 (a), worker must not be exposed to sound levels above 90 dBA for any eight hour shift of a 40 hour work week. Silencing Mufflers help plants meet this OSHA requirement by reducing the sound to safe levels below 90 dBA. They also eliminate harmful dead end pressures. Each style of Silencing Muffler shown has a high airflow capacity, with low back pressure. Popular NPT sizes are ideal for new and existing installations. Drum Dollys are available for 5, 30, 55 and 110 gallon drums. If your application may require moving your vacuum around the plant, these dollys are rugged and will make moving the vacuum systems from place to place easy. Some applications require an intermittent demand for a high volume of compressed air. This can cause fluctuations in pressure and volume throughout the compressed air system with some points being "starved" for compressed air. EXAIR's Model 9500-60 60 Gallon Receiver Tank can be installed near the point of high demand so there is an additional supply of compressed air available for a short duration. The time between the high volume demand occurrences should be long enough so the compressor has enough time to replenish the Receiver Tank. 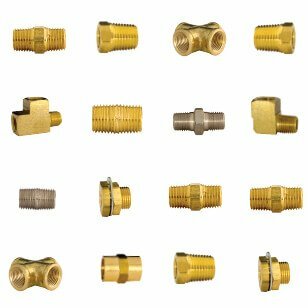 EXAIR offers a variety of NPT compressed air fittings for aid in plumbing your compressed air products. 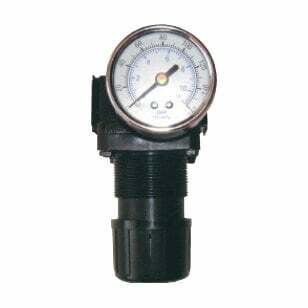 Pressure and Vacuum gauges provide accurate reading of pressure for all of your compressed air products and applications. The adjustable thermostat used with Cabinet Cooler systems is factory set at 95°F (35°C). It will normally hold ±2°F (1°C) of the desired temperature setting. It is rated 24V-240V AC or DC, 50/60 Hz and is UL Recognized, CSA Certified. Stainless Steel Super Air Knives that are 24" or longer must be supplied with compressed air at multiple inlets on the knife to ensure even airflow. Air Knife Plumbing Kits eliminate the need to search for the right fittings and ensure that you are using properly sized air supply lines. 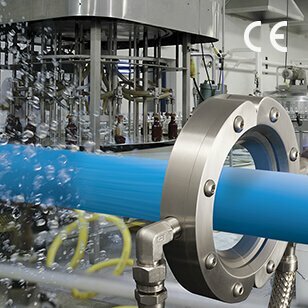 The Kits include compressed air pipe of the proper diameter and length plus fittings to interconnect the bottom or end compressed air inlets for best performance. Plumbing kits for stainless steel Super Air Knives include cut to length type 316 stainless steel pipe and fittings and will also work on PVDF Super Air Knives. WARNING! Cancer and Reproductive Harm - www.P65Warnings.ca.gov/product. What are the temperature limits for your air knives?Can I operate your air knives with a blower?How much pressure should I use on your air knife?We have some dead spots on our air knife. What should we do?Can I use a Stay Set Hose with an Air Knife?Can I cut an air knife to length in the field?Does the airflow from your air knife need to be pointed downward as shown in your catalog and on your web site in order to be effective?What material is an Air Knife made from?How can I mount EXAIR’s Air Knives?What is a Plumbing Kit?What are the different Air Knife shim sizes and their color?I need more force out of my air knife, how do I get it?What is the maximum temperature rating for the Model 9060 Universal Mounting System?Can I connect the output of a Vortex Tube to an Air Knife?Can I connect the output of a Vortex Tube to an Air Amplifier or Air Knife?I can't get enough airflow out of my air knife. Should I add more shims?I see your Super Air Knives come in stock lengths up to 108". What's the longest Air Knife available? Are other lengths available that you do not show in the catalog? There are a variety of ways to blow the water from the bottles shown in the photo below, but which method is best? The following comparison of drilled pipe, flat air nozzles, a blower and the Super Air Knife proves that EXAIR has the best choice for your blowoff, cooling or drying application. Our goal for each of the blowoff choices was to use the least amount of air possible to get the job done (lowest energy and noise level). Compressed air pressure required for each was 60 PSIG (4.1 BAR) which provided adequate velocity to blow the water off. The blower used had a ten horsepower electric motor and was a centrifugal type blower at 18,000 RPM. The table at the bottom of the page summarizes the overall performance. Since your actual part may have an odd configuration, holes or sharp edges, we took sound level measurements in free air (no impinging surface). This common blowoff is very inexpensive and easy to make. For this test, we used (2) drilled pipes, each with (25) 1/16" (1.6mm) diameter holes on 1/2" (13mm) centers. As shown in the test results below, the drilled pipe performed poorly. The initial cost of the drilled pipe is overshadowed by its high energy use. The holes are easily blocked and the noise level is excessive - both of which violate OSHA requirements. Velocity across the entire length was very inconsistent with spikes of air and numerous dead spots. As shown below, this inexpensive air nozzle was the worst performer. It is available in plastic, aluminum and stainless steel from several manufacturers. The flat air nozzle provides some entrainment, but suffers from many of the same problems as the drilled pipe. Operating cost and noise level are both high. Some manufacturers offer flat air nozzles where the holes can be blocked - an OSHA violation. Velocity was inconsistent with spikes of air. The blower proved to be an expensive, noisy option. As noted below, the purchase price is high. Operating cost was considerably lower than the drilled pipe and flat air nozzle, but was comparable to the EXAIR Super Air Knife. The large blower with its two 3" (76mm) diameter hoses requires significant mounting space compared to the others. Noise level was high at 90 dBA. There was no option for cycling it on and off to conserve energy like the other blowoffs. Costly bearing and filter maintenance along with downtime were also negative factors. The Super Air Knife did an exceptional job of removing the moisture on one pass due to the uniformity of the laminar airflow. The sound level was extremely low at 65 dBA. For this application, energy use was slightly higher than the blower but can be less than the blower if cycling on and off is possible. Safe operation is not an issue since the Super Air Knife cannot be dead-ended. Maintenance costs are low since there are no moving parts to wear out. High noise levels are a common problem for many plants. 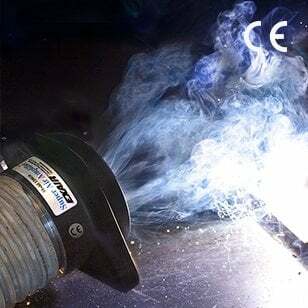 Compressed air noise often exceeds OSHA (Occupational Safety and Health Administration) noise level exposure requirements, resulting in hearing loss to those working in close proximity. The sound level of the Super Air Knife is quiet at 69 dBA, even at high pressures of 80 PSIG (5.5 BAR). Using the Super Air Knife, it is possible to obtain hard-hitting force without the high noise. 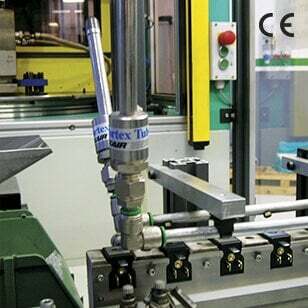 EXAIR manufactures special Super Air Knives suited to specific application requirements. The shape, dimensions and materials of construction can be modified to fit existing machines and environments. A special curved stainless steel Super Air Knife holds test tubes in place on a rotating index table. This curved stainless steel Super Air Knife was manufactured for a laboratory that uses the force of the airflow to hold test tubes in place on a rotating index table. They were able to eliminate the mechanical clips and latches that slowed the test tube removal. This holding method minimized risk of tube breakage and eliminated any chance of puncturing the technician’s rubber gloves. A PVC Super Air Knife designed to withstand a phosphorus environment. 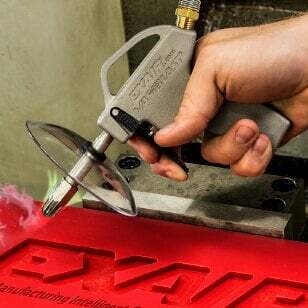 EXAIR manufactures special Super Air Knives made of plastic. These products are engineered to work under normal operating pressures, providing the same performance as their aluminum and stainless steel counterparts. This special PVC Super Air Knife was manufactured for a picture tube plant. The softer material was less likely to scratch the picture tube surface and was chemically resistant to the phosphorus which coated the inside. A flat Super Air Knife, only 11/16" thick, blows plastic fibers from a mold used to make integrated circuit chips. 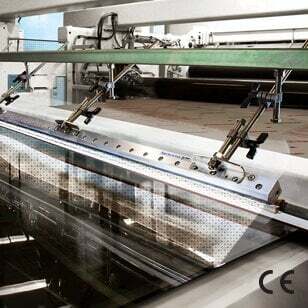 The flat Super Air Knife is used in a molding machine for integrated circuit chips. 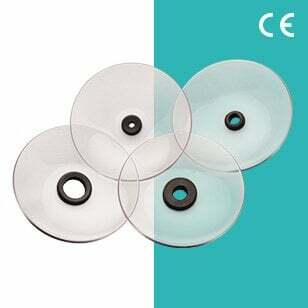 Prior to molding the black plastic shells around the silicon wafers, they blow the mold cavity clean of any fine plastic fibers left by the previous cycle. The flat design constructed of corrosion resistant stainless steel was made to fit the tight space of the molding machine. The double-sided Super Air Knife provides two uniform sheets of laminar airflow. The double-sided Super Air Knife provides two uniform sheets of air in opposite directions. It is ideal for blowing water from two or more columns of stacked parts (like printed circuit boards) as they are lifted out of a bath or the open halves of a mold. Each side operates independently. Stainless steel Super Air Knife modified to include extra mounting holes. As in this example, the Super Air Knife can be modified to include extra mounting holes to suit your application. The Problem: A manufacturer of automotive electronics had a problem cooling computers as they exited a wave solder machine. In order to be handled and tested, the computers had to first be cooled to 81°F (27°C). Initially, they had tried banks of 6" (152mm) diameter axial fans across the 8' (2.5m) length of the cooling conveyor. It consisted of 16 fans blowing down from the top and 16 fans blowing up from the bottom at 7" (178mm) away from the surface. After traveling the full length of the conveyor with the fans running at full force (a five minute duration), the computers were still 108°F (42°C). Quality control personnel sat with an unacceptable backlog of computers waiting to be tested. The Solution: The company removed the top and bottom fan banks and replaced them with (3) Model 110012 12" (305mm) Super Air Knives that were evenly spaced across the cooling section. Each Super Air Knife was angled so the computer and heat sink received the constant rush of airflow. With the conveyor at the same speed 1.6 FPM (0.5m/min), and Super Air Knives at only 40 PSIG, the computers were cooled to 81°F (27°C) in 90 seconds! Comment: The laminar airflow of the Super Air Knives was the key to success in this application. Fan cooling could only provide random spikes of air at moderate velocities. The uniform sheet of air from the Super Air Knife quietly swept the heat away within the first 2' (610mm) of the conveyor. Low air consumption and the compact size of the Super Air Knife were an added bonus. The Problem: A dirty lens can affect the quality of cameras, sensors and lasers. 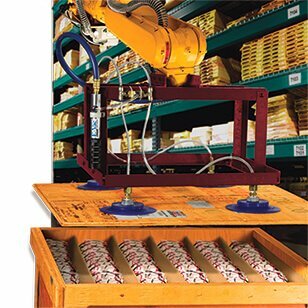 Today’s visual inspection systems are highly accurate tools used to monitor dimensions, temperature, finish quality, labeling and much more. These products require clean lenses in order to provide the proper feedback to operators or other machinery within the process. The above laser lens is integral to a laser cleaning operation where a laser is used to clear away debris and provide a fresh surface. The laser cleaning operation in this case was creating debris which flew up and deposited on to the laser lens. Debris on the lens could affect the laser’s cleaning quality or become burned upon the lens and create the need for a replacement lens. The Solution: A Model 110006 6” (152mm) Super Air Knife was installed just above the laser lens to blow air down and across the lens. The sheet of air created an invisible barrier the contaminants could not penetrate and kept them from depositing on to the lens. The quality of the laser cleaning has been consistently good and the need for replacement lenses due to debris deposition has been eliminated. Comment: An air barrier is a common application for a Super Air Knife and can create a non-contact wiper with little or no obstruction. They have been used in similar applications to prevent debris from getting to many different sensors or cameras, to retain heat within an oven, or to deflect mist from a machine tool. The Problem: A bakery had a problem applying the icing to their snack cakes. As the baked sponge cakes moved down the conveyor, a continuous ribbon of icing was applied to the individual cakes. Trying to make a clean break in the icing was next to impossible. Mechanical blades required constant cleaning. Compressed air through a series of holes in drilled pipe used too much air, was noisy and didn't make a clean break in the icing. The Solution: A Model 110018SS 18" (457mm) Stainless Steel Super Air Knife was installed across the conveyor. A photo eye is used to detect the space between the cakes and turn the compressed air on at the precise moment to apply uniform airflow and velocity against the ribbon of icing, creating a nice, clean break. Comment: The Stainless Steel Super Air Knife was the best choice for this application. Since there was no contact with the icing, no additional cleaning was required. The laminar flow of the Super Air Knife has uniform velocity across the entire length and broke the ribbon of icing evenly. This would never have been possible with the spikes of air from a drilled pipe, nozzles or a blower. The Problem: The last step in an engine assembly process is "burn-in" on a test stand. Each engine is connected to a dynamometer and run for a period of one to five minutes. 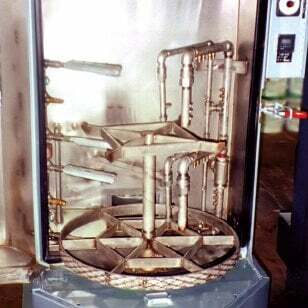 Residual machining oil on the head produced smoke during the test, and the vent hood at the top of the stand had insufficient capacity to contain it. The Solution: A Model 110024 24" (610mm) Super Air Knife was mounted on both sides of the test stand. The sheet or "wall" of air produced by the Super Air Knife, captured, contained and diluted the smoke while directing it towards the vent hood. The environmental problem was solved without obstructing the technicians observation of, or access to the stand. The Problem: A bottling plant places their filled bottles into plastic crates as a final step of their process. When the empty plastic crates are returned from the various retail markets, they must first be washed and sanitized prior to using them again. When the bottler put the crates through the washer, they exited the final rinse dripping wet. Bottles placed in the wet crates were eventually covered with water spots and many product labels were ruined. The Solution: The company installed (3) Model 110018 18" (457mm) Super Air Knives to completely surround and blowoff the crates. Each Super Air Knife was placed on a wiping angle with the sheet of air blowing against the travel of the crates and directing the water downward toward the floor. The crates were dried and the bottles could be loaded immediately. Comment: Super Air Knives were the best choice for this application. The uniform sheet of laminar airflow provided complete coverage so there were no dead spots when blowing across the inside and outside surfaces of the crate. The mounting used made it easy to rearrange and adjust the Super Air Knife depending on the size of the crate. Other companies have used a similar arrangement of the Super Air Knives to blowoff car batteries, blocks of cheese, milk cartons, buckets, and more. Copyright ©2019 EXAIR Corporation. All rights reserved.